Hey guys! A little over a year ago, I saw the Vaseline Spray & Go Moisturizer during the annual S&R sale. I was so close to buying one but I decided to skip it instead due to the pricey tag. 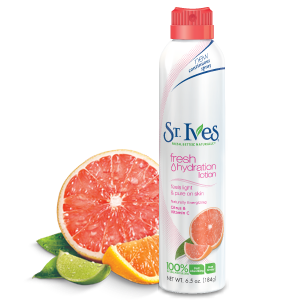 Since then I've been looking for a cheaper substitute but never got to find one until last week when I finally saw the St. Ives Fresh Hydration Lotion. It comes in a 6.5 fl oz spray can that snugly fits your grip. I love that the nozzle is designed to perfectly deliver a thin mist of heavenly scented moisturizer. This revolutionary spray on lotion makes it a lot easier for those like me who don't enjoy the heavy feel of thick body butter, cream or lotion. Another cool thing about the packaging is you can twist the cap both ways to protect the nozzle. What's even cooler (literally) is the fresh feeling you get once the mist hits your skin. To use, simply direct the nozzle to your desired body part at about 4 inches away from the surface, hit the button and spray away. I love that you can tilt the can in any direction and still get it to spray on continuously hence there's no excuse not to moisturize hard to reach areas like your back. After applying, follow with a gentle rub to completely spread the product all over. The St. Ives Fresh Hydration Lotion comes in 3 variants, Oatmeal & Shea Butter, Coconut Milk & Orchid Extract and Citrus & Vitamin C. Since all three contain vegetable glycerin and shea butter, I went for the one with the most pleasing scent (in my opinion), Citrus & Vitamin C. The formula is non-greasy and light yet effectively hydrates your skin. I love that it gets absorbed quickly so you won't have to wait for it to dry before dressing up. This light weight moisturizer surprisingly keeps your skin soft and supple all throughout the day without the need to reapply. Overall, I am totally obsessed with this lotion and I do recommend it to everyone who wants a no fuss skin care product that works. I'm also ecstatic to find out that the local price tag of Php 324.75 isn't at all far from the international retail price ($7.69). I think it's quite safe to say that this spray on lotion from St. Ives will be making waves in the beauty industry. I will have to try the one from Vaseline soon and see how they fair when compared but right now I'm loving St. Ives to bits. 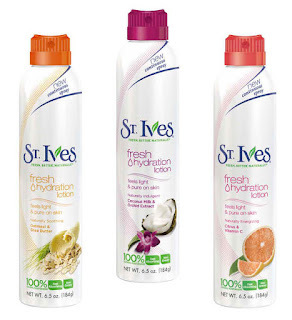 Any thoughts on the St. Ives Fresh Hydration Lotion? Have you tried any of the variants? Which one is your current favorite? Comment below and share those thoughts. 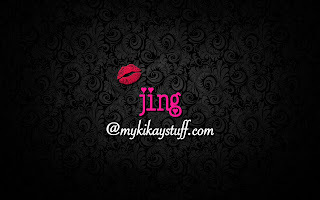 Thank you for reading my post and have a great weekend!